About Us - West Environmental, Inc.
Mark West started West Environmental, Inc. in 1998. 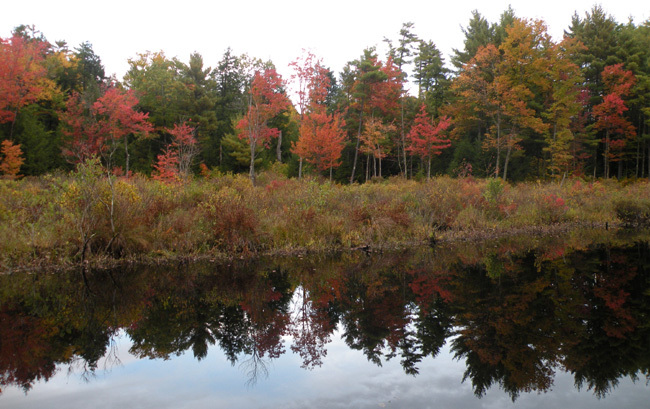 He has been working in the field of Wetland Science for over 25 years and has mapped and evaluated thousands of wetlands in New Hampshire, Maine and Massachusetts. He has a broad range of ecological experience with plant community and wildlife identification. He has served on his local conservation commission in Nottingham, has been an adjunct professor at Antioch New England Graduate School, and is currently Chair of the Board of Bear-Paw Regional Greenways a Land Trust in northern Rockingham County. He has taught a variety of workshops on wetlands, wildlife and natural resource protection. He brings his extensive experience to projects ranging from municipal review to wetland evaluation and mapping. He also has close working relationships with local, state and federal regulators and is well known for his expertise in wetlands science. Beautiful fall foliage along the banks of the Bean River.